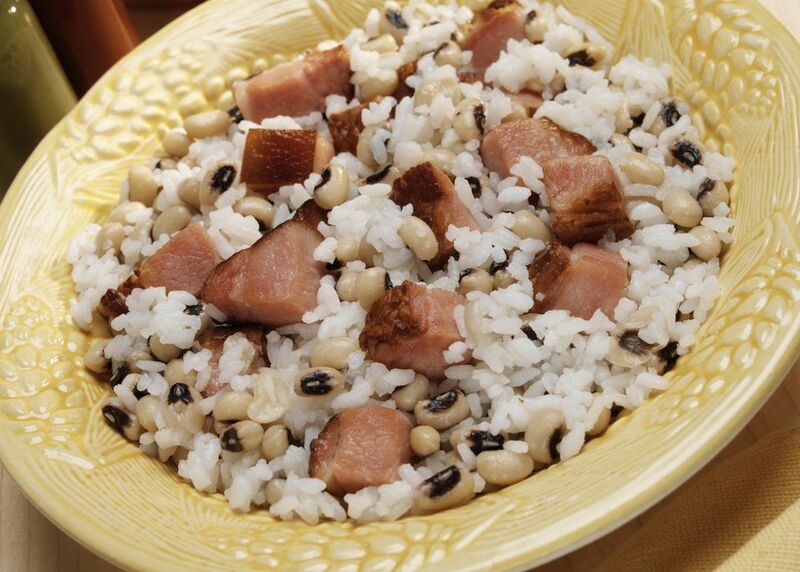 These black-eyed peas are seasoned with pork jowl—aka hog jowl—or diced thick bacon. The peas are an excellent choice for a New Year's Day meal. Black-eyed peas are traditionally eaten on New Year's Day for good luck in the coming year. Pork is thought to be symbolic of money (or wealth, abundance, etc.). Instead of crushed red pepper flakes, feel free to use a dash of ground cayenne pepper or about 1 teaspoon of spicy Cajun seasoning. For a satisfying Southern-style meal, serve the black-eyed peas with cornbread (this is essential), seasoned turnip greens, collards, or mustard greens, and hot boiled rice. Some additional excellent choices for a Southern feast: crispy fried okra, fried green tomatoes, fried chicken, chow-chow relish or corn relish, fried corn, and sweet tea. Finish the meal off with velvety banana pudding, chess or pecan pie, or an impressive, delicious hummingbird cake. Rinse the peas and pick them over for bad or discolored peas and small stones; transfer to a medium saucepan. Cover with water and bring to a boil. Reduce heat to a simmer and continue cooking for 5 minutes; set aside. Meanwhile, dice the pork jowl or bacon. Put the diced pork in a large stockpot or Dutch oven and cook over medium heat for about 5 minutes, or until fat is rendered, stirring frequently. Meanwhile, peel and dice the onion and carrot. Peel the garlic; mash it lightly with the side of a knife and then mince it. Add the onion and diced carrot to the pork. Cook until tender the onion is translucent and the carrot is beginning to soften, or about 6 to 8 minutes. Add the garlic and cook for 2 minutes longer. Add the black-eyed peas and enough fresh water to cover by 2 inches. Add the crushed red pepper flakes, black pepper, thyme, and oregano. Bring the peas to a boil; cover the pan and reduce the heat to medium. Simmer the black-eyed peas for about 1 hour. Uncover and continue to cook for 30 to 45 minutes longer, or until the peas are tender. Add more water as needed to keep them moist. When the peas are tender, stir in the salt and Tabasco sauce, if using. Serve with hot baked cornbread and a tossed salad. If you prefer an overnight soak, follow the package directions and skip the 5-minute simmer. Drain the peas and add them to the pork and vegetable mixture. Cover with water and cook as directed.